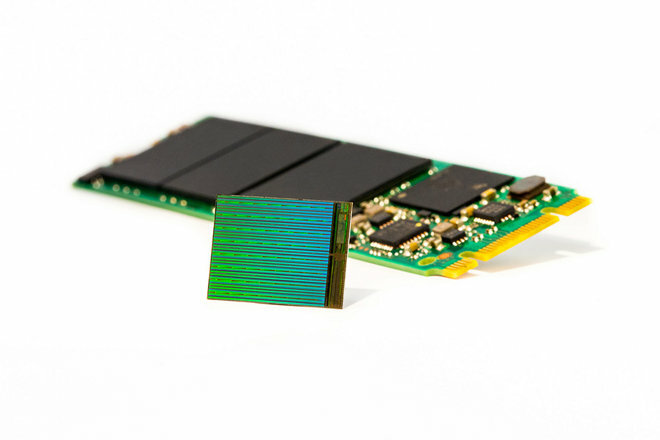 Unlike conventional planar NAND flash memory, 3D NAND is stacked in 32 vertical layers. According to Intel this can potentially triple capacity, for example allowing "gum-stick sized" solid state drives with over 3.5 terabytes of storage space, or conventional 2.5-inch solid state drives (SSDs) that surpass 10 terabytes. Even the SSD in a custom-configured iMac or Mac Pro currently tops out at 1 terabyte. The technology is also said to have a variety of ancillary benefits, including high speeds, a lower cost per gigabyte, and better endurance. It should also save power by enabling new sleep modes that cut power to inactive NAND die while other die remain in use. A 256-gigabit multilevel cell (MLC) version of the memory is now being sampled with "select partners," Intel said. A denser 384-gigabit triple-level cell (TLC) product will be sampled later this season. Both forms of memory should be in full-scale production by the fourth quarter of 2015, and matching Intel and Micron SSD lines should be on sale "within the next year." In Apple's case, the technology could allow the company to completely jettison conventional hard disks in Macs, and all but eliminate storage anxiety with iOS devices. While iPhones and iPads doubled the capacity of their middle and upper tiers last year, the bottom tiers remained stuck at 16 GB, an increasingly tight limit on the amount of apps, photos, videos, and music a person can carry with them. Toshiba has meanwhile revealed its own 3D flash memory, a 48-layer MLC format using a vertical stacking system called BiCS (Bit Cost Scaling). This can hold 128 gigabits per chip, and sample shipments began on Thursday. Mass production is waiting on a new facility in Japan, however, which is only due to finish construction in the first half of 2016.